It's about time. Hopefully Walmart will jump in the bandwagon also, as I shop there far more often than TGT. Using it at Taco Bell is a minor convenience for me. I always use it at MCD which is one of the reasons why I always go there. What I want to see Apple target is online payment of utilities. Many use a service called Bill Matrix which charges outrageous fees for you to be able to use your Check Card/ Debit Card. I paid Entergy (my electric utility) yesterday and Bill Matrix charged $2.95 just to process the transaction. CenterPoint Energy (my gas company) does the same. In 2019 it should not cost that kind of fee to process a debit card. Since these are utilities you really do not have a choice for online payment unless you want to enter your checking account and give them automatic draft permission. Where-ever available, I use Apple Pay. Secure and convenient. Glad to hear it. It’s about time. Walmart next. Good to see this news. I had a big aversion to walmart pay I think it’s been tweaked since it was introduced and I only use it now. Just pull up the app and scan the qr code and you’re good to go. Obviously I would like Apple Pay there but for the time being it’s fine. Works pretty seaminglessly. I just scan the qr code as the worker is scanning. I'm very curious if Target will integrate this with their own two RedCard programs. They have a regular branded MasterCard and a separate RedCard which directly debits from your checking account. With either of those payment methods, you get an additional 5 percent off your purchase. My wife and I use our RedCard at Target all the time, and it is integrated into their iPhone app along with their Cartwheel discount program. The cashier simply scans one barcode on my phone or AppleWatch and boom, it does it all. Does the Cartwheel discounts, the 5 percent RedCard discount, any other e-coupons, any gift cards I've added to my phone, and done in a few seconds. If they can make that all work with ApplePay, even better. But I will say it's very slick the way it is at Target. And no, I have no connection to Target other than a satisfied customer who is trying to get them to build a store near my house. This is awesome. We do almost all of our routine shopping at Target and HyVee. The Target app QR system did work well, so it was less of an issue there, but Apple Pay is still more convenient. I assume we’ll be able to add our Target card to Apple Pay. Wince we get a 5% discount with it, using a regular credit card there makes no sense. My big complaint with ApplePay is not the system, rather that it’s often poorly marked and still has spotty enough availability that I’m often dont know whether it’s accepted at a merchant. Another big plus with ApplePay is that you dont’ have to re-enter the data if you have to replace your card. Not sure how that’s Target’s fault - it’s really no different than any other retailer or card. Tou can set your marketing e-mail preferences to reduce/avoid the spam and you can also set your account to automatically pay the minimium amount each month so you don’t miss a bill. Relying on an email to remind you to make a payment doesn’t seem like the best system, to be honest. I have all my cards set up that way and I avoid using accounts that won’t let me do it. You still get an interest charge, but at least you don’t get hit with a late payment fee. Chalk one up for Apple's 'Privacy' stance! Yes I was wondering if they would add their RedCard support to Apple Pay. Makes sense that they would. I use that card all the time at Target. What I want to see Apple target is online payment of utilities. Many use a service called Bill Matrix which charges outrageous fees for you to be able to use your Check Card/ Debit Card. I paid Entergy (my electric utility) yesterday and Bill Matrix charged $2.95 just to process the transaction. Mine does also, but I found a solution. I just pay $1000 at time and then the $3.50 charge is somewhat meaningless. And, I get my points on my card. Credit cards have transaction or swipe fees associated with them. Merchants eat these costs(although many put a minimum purchase amount on card transactions,) but utilities don’t. In the case of many government agencies they are required to pass on this fee. Just tried to add my Red Card (credit) and it wasn't supported yet. Hopefully, TD Bank and Target will add support soon. It's pretty strange that it took Target this long to finally support Apple Pay in their Stores!!!! Target has Supported Apple Pay since day 1 for Online Shopping. So it's good see see them finally cave. Same goes for Taco Bell and Jack on the box. The more places the better. Wal-Mart is going to be the last holdout. They are going to stick with their QR codes for as long as they can. Keep your fingers crossed. TD Bank started supporting Apple Pay on their own branded cards years ago. Love Apple Pay. It's one of those technologies that is surprisingly convenient, especially because those PIN cards are so, so finicky. I was waiting in line behind a person paying with it, and it was like an Apple commercial. First they put it in and pulled it out too fast, but the cashier didn't notice, so she just tried it again, and it wouldn't work, then she tried another card, but it was stripe only, and on and on. Not usual, but after that the cashier told me that Apple Pay is noticeably faster in just about every case. I haven't been in Target for quite a while. 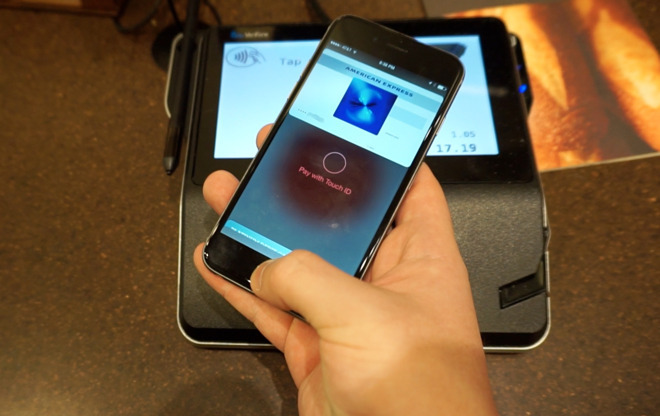 The payment terminal has to support contactless payments to also allow Apple Pay to function. So the company will face the cost of getting new terminals for all their checkouts. Aldi's is one of the companies that started accepting Apple Pay months ago, and a store I go to when I pop across the border to Niagara Falls, NY. for some shopping. Being Canadian, I use Apple Pay almost everywhere here. If people think there must be a sign or sticker indicating Apple Pay accepted, they are wrong. All it takes is the store having a contactless terminal. Those terminals also support tapping your chip credit card, if YOUR card also allows contactless.